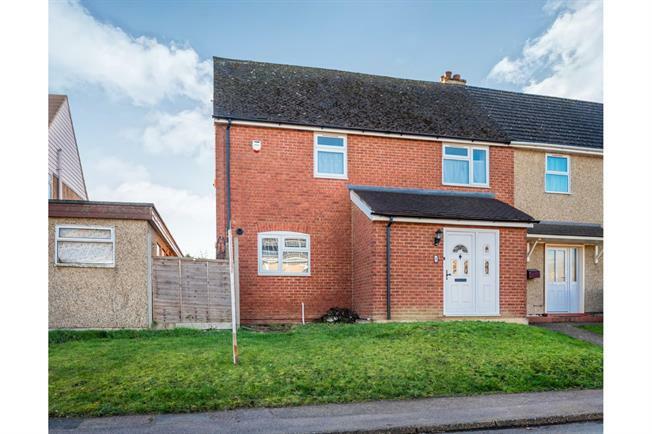 3 Bedroom Semi Detached House For Sale in Dunstable for Offers Over £325,000. A completely restructured and refurbished three bedroom semi-detached family home occupying a southerly facing plot, with a rear garden in excess of 100ft. Accommodation briefly comprises of entrance porch, entrance hall, lounge/diner and a refitted kitchen at ground floor. First floor comprises of three bedrooms and a refitted a family bathroom. Further benefits include gas central heating to radiators, UPVC double glazing and a large brick built outbuilding with outside toilet, butler sink and electricity. Spacious area with door to entrance hall. Storage cupboard, stairs rising to first floor and door to lounge. Double glazed UPVC door leading onto the rear garden, UPVC double window to rear aspect. Double glazed UPVC window. Roll top work surface, built-in wall and base units, one and a half bowl sink, space for oven, door to side aspect leading to the garden. Single bedroom; double glazed UPVC window to front aspect. Double glazed UPVC window with frosted glass. Low level WC, freestanding bath with mixer tap. Large outbuilding to side of property. Garden in excess of 100ft, large outbuilding and outside WC. Laid to lawn, permission was previously granted to create off road parking.